This medication is known as a Gonadotropin. 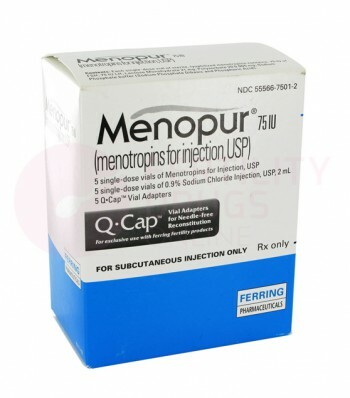 Menopur is an injectable, highly purified human menopausal gonadotropin (hMG). Each vial contains 75 IU (International Units) of powdered medication to be mixed with diluent. Menopur is a gonadotropin that contains a combination of follicle stimulating hormone (FSH) and luteinizing hormone (LH) that stimulates the ovaries to produce eggs. 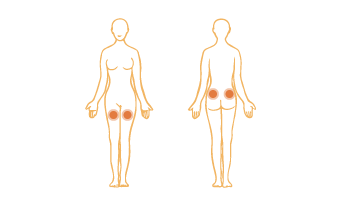 Menopur side effects may include some local discomfort, bruising and soreness at the injection site. Changes in mood, headache, abdominal discomfort, nausea, bloating and cramping are other possible minor side effects. Multiple births occur in about 20-25% of pregnancies of which 70% are twins. Excessive enlargement of the ovaries, called ovarian hyperstimulation syndrome (OHSS) may occur. Symptoms of OHSS include excessive fluid retention, severe abdominal discomfort, shortness of breath, weight gain, and nausea or vomiting. If you experience an allergic reaction: difficulty breathing; closing of throat; swelling of lips, tongue or face; or hives; seek emergency attention immediately. If at any time you experience pain, warmth, redness, numbness, or tingling in an arm or leg; confusion, severe dizziness or severe headache, seek medical attention immediately. If at any time you experience bone pain, difficulty urinating, numbness, tingling or weakness in the arms or legs contact your physician immediately. PLEASE NOTE: If these or any other side effects occur, consult your doctor. Store Menopur at room temperature or refrigerate. Menopur cannot be mixed in advance. Once mixed, it must be used within 15 minutes. Pop off the plastic top of powdered medication and diluent (liquid). Place the spike end of the Q-Cap over the top of the sterile diluent vial, and firmly push down until the Q-Cap spike is through the rubber stopper. Press down on the plunger of the air filled syringe to transfer the air into the vial in order to equalize the pressure, which will make withdrawal of the diluent easier. Invert, or turn upside down, the syringe with Q-Cap and vial as one complete unit, and withdraw 1cc of the diluent. Remove the Q-Cap and syringe from the vial by pulling on the syringe barrel. Hold the Menopur vial in one hand, grasp the sides of the syringe in the other hand and place the tip of the Q-Cap over the top of the vial and push the Q-Cap through the rubber stopper. Slowly and cautiously deposit the diluent into the vial of powdered medication. Rotate the vial between your thumb and index finger until the solution is clear. Invert, or turn upside down the syringe with Q-Cap and vial as one complete unit and withdraw the contents of the vial. Holding the syringe pointing upwards, twist the syringe counterclockwise while holding the Q-Cap steady to remove the syringe from the Q-Cap. Twist on the ½” needle for subcutaneous injection or 1 ½” needle for intramuscular injection. Tap the syringe to force any bubbles to the top. Depress the plunger to expel the air. If you are mixing a single vial, you are now ready for your injection. With Q-Cap still attached to the syringe, inject the contents of the syringe (powdered medication mixed with the diluent) directly into the next vial of powdered medication, slowly and cautiously. This will increase the dosage without increasing the liquid volume. Do not use more diluent for additional vials of Menopur. Again, rotate the vial between your thumb and index finger until the solution is clear. Withdraw the newly mixed Menopur from the second vial back into the syringe. Repeat until you have reached your prescribed dosage.